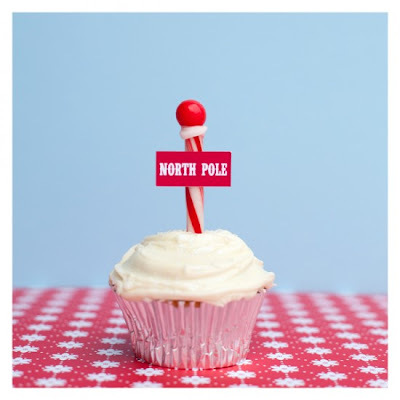 Amanda's Parties To Go: Christmas Cupcakes Roundup! Be still my beating heart, Bakerella! 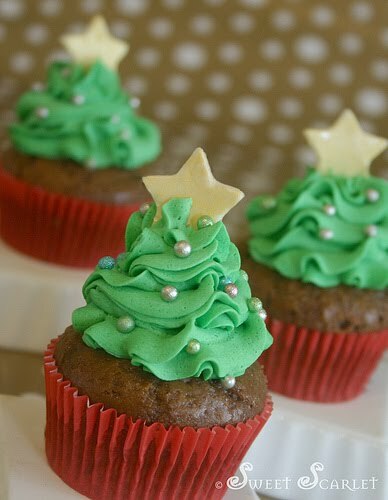 What a gorgeous cupcake you can make! The girl can do no wrong in my eyes. And is this not the cutest thing you've ever seen?? 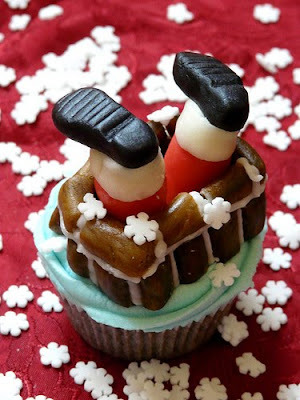 Sugar Daze has created one fantastic cupcake with their Santa going down the chimney. And so very simple, but oh so "charming" is this North Pole cupcake from One Charming Party . I might just have to make these for my son's kindergarten class. 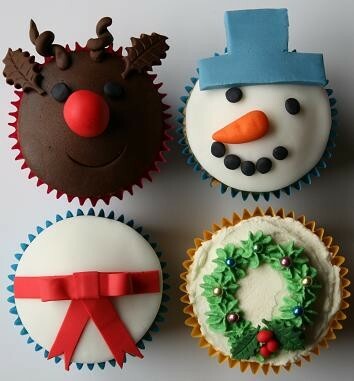 The Cupcake Oven has a beautiful assortment of fondant cupcakes -- just look at that reindeer! 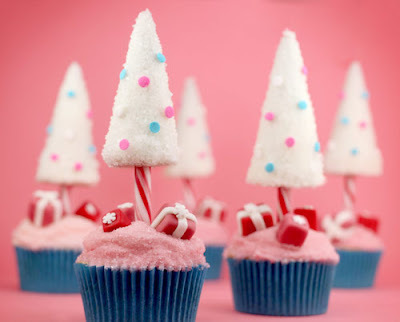 Hoosier Homemade has some adorable elf cupcakes. I think the kids would LOVE these! 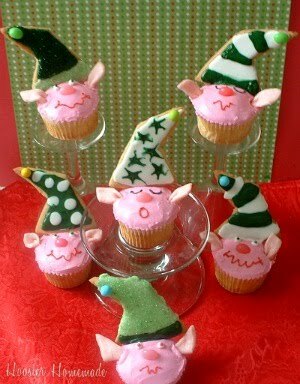 Maybe that silly little elf everyone has on their shelf could help you make a few of these. Sweet Scarlet's Cakes and Cupcakes makes a simple but beautiful Christmas tree cupcake using lots of green tinted frosting and a fondant star topper. 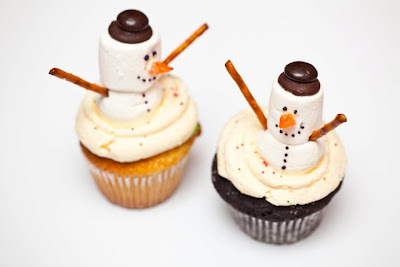 Cupcakes Take the Cake features a sweet snowman cupcake from Dollop Gourmet that looks pretty easy, even for the kids. A little frosting, a few marshmallows, a orange gumdrop nose and some pretzel arms. Cute - cute! 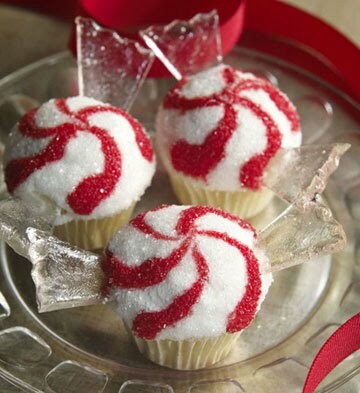 Another favorite.... these Starlight Mint cupcakes from What's New, Cupcake? What talent that lady has! Whipperberry is a favorite blog stop of mine as well. Just look at these gorgeous but simple cupcakes she featured from Sweet Street Cakes. 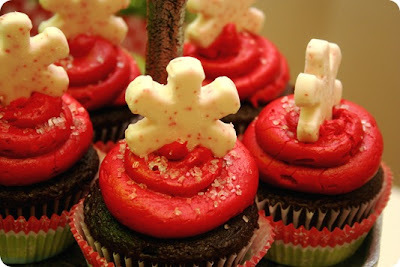 Katie uses a molded chocolate snowflake as an adorable topper for her double chocolate fudge cupcakes. Whew, That was alot of sugar! I hope you all enjoyed the round-up! I love your site!!! I put your link on my fb page. Very cute!! Thanks, Barb. Of course it's OK -- share the love! Thanks so much for including me in this awesome round up! i didnt find the link for that one cute little snowman but im pretty sure its just peeled apples carrots and the bottom has cherry tomatoes circling it.